Swiss Chard—what the French call blettes—is a fabulous leafy green that’s chock full of vitamins and fiber, but also tastes really, really good. Think of it like a little between spinach and a beet, with with a fabulous depth of flavor all its own. I particularly enjoy the veggie in autumn: when you still crave a salad, but want something hearty. It goes great with apples (as you’ll see here). In winter, serve this dish with a soup for a super-fresh but wonderfully warming lunch or dinner. As an aside: I’ve heard that some French cooks only use the stalks (they’re the part that taste like beets, but with a celery-like freshness and crunch). And other cooks only use the leaves. 2. Season the chicken breasts with salt and pepper and brush them lightly with olive oil. Place the chicken breasts in a shallow baking dish and bake until the internal temperature registers 170°F on an instant-read thermometer, about 20 minutes. Transfer the chicken to a cutting board to rest for 5 minutes or so. 3. 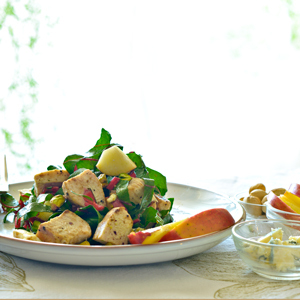 Meanwhile, combine the Swiss chard, apple, blue cheese, and pistachio nuts in a large bowl. Whisk together the olive oil, balsamic vinegar, and salt and pepper in a small bowl. 4. Using two forks, shred the chicken into bite-size pieces. Add the chicken to the chard mixture and toss to combine. Add the vinaigrette and toss again to combine. Divide the salad among four shallow bowls and serve. Makes 4 main-dish servings. Hi, Wini. How come CBF won’t display in the landscape orientation (at least not on my phone)? You’re asking me? I’m sorry, Chap, I have no idea. I’m amazed sometimes that I can even figure out how to post anything! This recipe sounds wonderful. I stumbled upon it while surfing the web for ideas for what to bring to my husband’s conversational french class potluck. This is it!!! Enjoy! It really is a great fall salad. I tried to link up with a recipe to print after watching the video, but it went nowhere and I do not see this recipe with the ones listed on your website. Once you get to the page, scroll down to the recipe. Enjoy! It was a hit. I do not know much about blue cheese so was at a loss at Whole Foods trying to choose one for the salad. I landed on Maytag. Stilton was also in the running. What is your favorite? I LOVE LOVE LOVE Point Reyes Blue Cheese, and the closer you are to California, the better it is. I buy Point Reyes in Des Moines, but today, I was in the Monterey area, and I had some Point Reyes (which is made North of San Francisco). It was creamy and luscious and wonderful, with just a great blue flavor. Yes, I like Maytag, and since it’s from my home state of Iowa, I should probably like it best…but truth is, if you’re west of the Missouri River, you might want to go for Point Reyes….